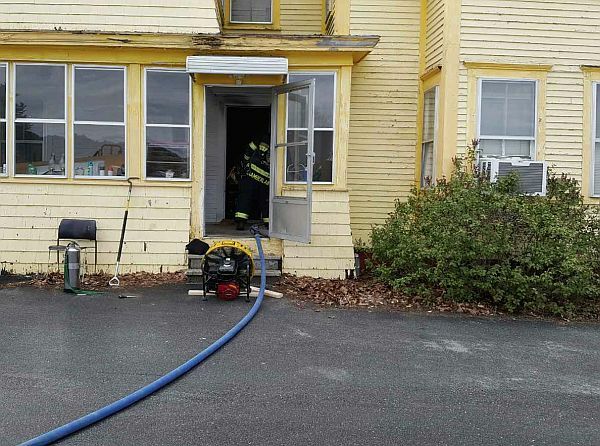 An unattended pan left on a stove was the cause of a fire in Claremont on Tuesday afternoon. Fire Chief Richard Bergeron said firefighters arrived at 8 Park Ave just before 2 PM to find light smoke coming from the multi-family dwelling. Jamie Mulhern, owner of the property, advised firefighters that there was a stove fire in the first-floor apartment, and that all residents were evacuated. The fire was contained to the kitchen cabinets and a small area of the ceiling, and extinguished quickly. However, the building sustained varying levels of smoke and fire damage. The fire was under control shortly before 2:30 PM. The Claremont Police Department and Golden Cross Ambulance assisted the Claremont Fire Department. A dispute over a handicapped parking spot lead to the arrest of a Lyme New Hampshire man. Lebanon Police say Dylan Derego took issue with the owner of a car parked in a Miracle Mile Plaza handicap space. During a brief exchange, Derego allegedly pulled and pointed a semi-automatic handgun on the other driver, then fled in his vehicle. An officer stopped a vehicle fitting the description given, and arrested Derego on interstate 89. Derego was charged with a Class B Felony of Criminal Threatening with a Deadly Weapon. Derego was released on $2,500 cash bail and will appear in Grafton County Superior Court on May 15th to answer the charges. The men’s lacrosse team at New England College swept the 2017 North Atlantic Conference Major awards, and placed 10 players on the All-Conference teams. In addition, team member Matt Richard was named NAC Player of the Year, Connor Fries received Defensive Player of the Year, and Jacob Blanchette was honored with 2017 NAC Rookie of the Year. The team’s Head Coach Jedd Brown was named Coach of the Year. Congratulations to New England College. Starting today, patrons of Howe Library in Hanover will be required to use the rear entrance due to repairs on the second floor windows. The rear entrance is off the lower parking lot, which is ADA accessible. The repairs are expected to continue for two weeks. Anyone with questions about the repairs and entrances should contact the Library Director, Rubi Simon 603-640-3251. A gas leak is repaired after West Street in Keene was shut down for several hours yesterday. Deputy Fire Chief Jeffrey Chickering said they were notified of a gas reading from a manhole shortly after 3:00 pm. Firefighters discovered gas in an Eversource Vault and triggered a 1st Alarm. The leak was found in a Liberty owned city gas pipe that feeds 19 – 25 West Street. Liberty Utilities was able to cut the pipe and plug the line to stop the leak. The incident was called under control just before 8:30 pm. There were no gas readings in any of the surrounding buildings throughout the incident. Keene crews were assisted on scene by Liberty Utilities, Brattleboro Fire, Keene Police, Keene Public Works, and Eversource. This is the third gas emergency experienced by Keene. The first was a citywide emergency in December of 2015 when a faulty mixture of gas at Liberty’s Keene production facility created carbon monoxide giving off gas fumes. Then in December of 2016, a crack in a gas pipe was discovered on Russell Street.